Betternet is a VPN service. What kind of VPN service? Read on to find out. A recently published research paper has highlighted that many of the free VPN service apps are actually dangerous to use. Betternet is one of those VPN service providers. Betternet has a rank of 13 in Virustotal AV-rank. The best VirusTotal AV-rank is 1. That makes Betternet one of the worst VPN apps that you can find in the market today. We don’t know any other way to say this but Betternet is infested with a ton of malware. Its VPN service will infect your device with nasty malware. And hence you should avoid using Betternet at all times. If you try to research Betternet on the internet, the most “official” source that you’ll come across is its own official website. The Betternet official website slaps users with a big claim as soon they enter it. The VPN service claims that it is an absolutely free VPN service. And that over 3.3 million people have installed its VPN app. 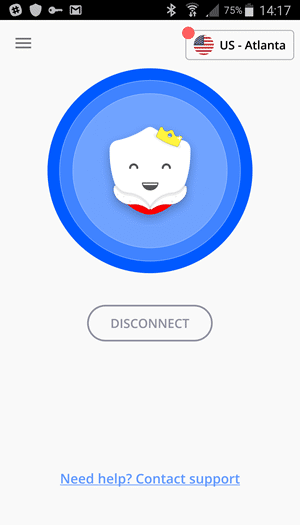 Moreover, the website also claims that Betternet has actually become the number one VPN app of the year on popular app resources such as AppStore and Google Play Store. Most of all though, the website also informs the user that more than 38 million people are using Betternet around the globe. We have no problems in admitting that before this Betternet review, we had never heard of it. And that’s saying something because we have worked in the VPN industry for a long time now and have reviewed all top VPN service providers on our site. So Betternet came to us with a bit of a surprise. With that said, it is true that Betternet has from 10 million to 50 million downloads on Google Play Store. So maybe there is some truth to the fact that Betternet may indeed have become the most used VPN service in the world today. Regardless, Betternet is a free VPN service. And it can also transform itself into a low-cost VPN solution. It focuses mainly on mobile users. And hence it isn’t exactly a proper VPN service provider. If we are talking about the qualities that make a VPN service great, then Betternet has none of them. But again, you are paying from nothing to very little for using Betternet. So we shouldn’t really complain. You shouldn’t really expect a free VPN service to outperform those that charge you a premium for a premium VPN service. If you take into consideration the price Betternet charges its customers, then perhaps it is a decent VPN service. The best part about Betternet free VPN service is that it doesn’t restrict the user in any meaningful way. They can use as much data as they want. Betternet has also promised its users that the company will never alter its terms of service. And hence will remain for a considerable amount of time in the future. Free users do have some problems though. They can’t connect to any server they want to. They have to choose a VPN server from the list of provided optimal servers. Our research for this Betternet review tells us that most of the servers that Betternet has are located in the United States of America. 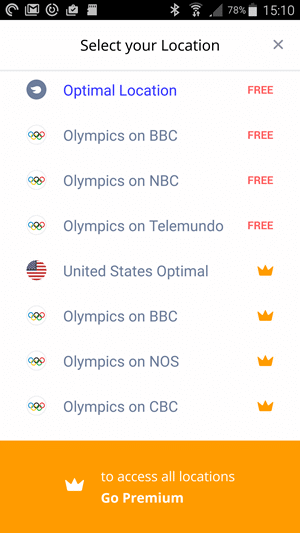 So if you want to watch some sporting events such as the Olympics then you can use Betterent to view all its phases and stages. BBC iPlayer is trying its best to ban VPN users. So perhaps, Betternet might face some problems in the future while trying to connect its free users to major sporting events. Moreover, if you try for a PlayBack via BBC iPlayer official website, you will feel a lot of clunkiness in your environment. But we are happy to report that BBC iPlayer does work with Betternet. For sports fans, this is undoubtedly great news. But this does little to the overall score of Betternet as a VPN service provider. Because we just don’t know when Betternet would stop offering free VPN servers for major sporting events. Special Offers For Different Users. Android and iOS users can avail an option that allows them to upgrade to Betternet premium VPN service. No such option is available for users who are on the Windows platform. 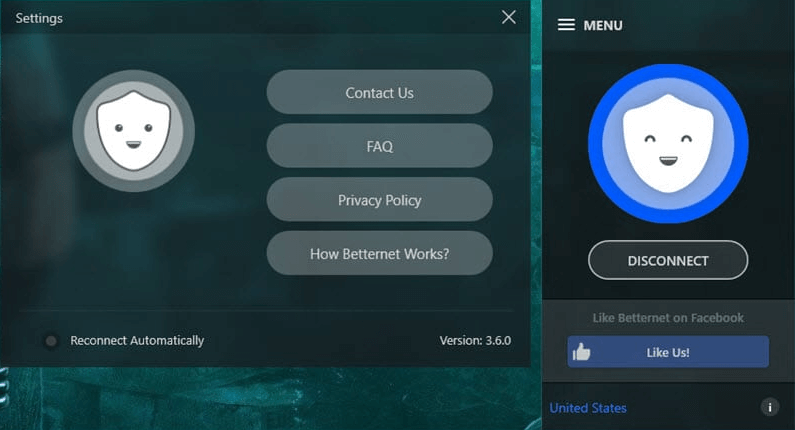 The premium Betternet VPN service costs users around $5 per month. If the user decides to pay for the full year at once then Betternet only charges the user around $2.50 per month. Premium users get servers which are located in over ten countries. The US, which has several VPN servers. Premium users also get a faster version of the same VPN service. Betternet hasn’t really quantified how much “faster” the premium service actually is, but we’ll take their word for it. You can check our speed section to know more Betternet performance. Betternet also doesn’t show any advertisements to premium users. As mentioned before, Betternet offers VPN servers in, at max, ten countries for its premium users. We have already mentioned the list of countries. The most important point to note here is that the US has multiple servers. And that is generally considered as a good thing. Premium users can connect up to five simultaneous devices with the same account. As mentioned before at the top of this review, Betternet doesn’t have any features out of the ordinary. This VPN service is free. So what else should we expect? Fortunately, Betternet does allow users to engage in P2P file transfers. Free users can avail this feature as well. According to official documents, the company says that if it receives a DMCA request for takedown via valid court orders, then the company has the policy to comply with the demand. But the company proceeds forward without jeopardizing and/or disrupting the privacy of its clients. The company also tells new users that it doesn’t store any logs. It doesn’t store user information, timestamps, and ports. And no, it doesn’t have any record of user IPs either. But the company also informs users that it has to satisfy some legal requirements. These requirements come from bandwidth providers. Even with that, the company does not disclose any of its user data to law enforcement authorities. Betternet also explains that the company has never received any valid court order till now. And hence it has never had to deal with something that required the company to provide sensitive information on its users. Do you believe Betternet official document? We can say with confidence that Betternet is the first VPN service that is free and also totally private. Why Would A Company Have Zero-Log Policy? Because having one saves any VPN service provider a lot of time and hassle. Copyright holders are an annoying bunch of people. Hence it is not worth it for any serious VPN service provider to engage with them. Betternet says that it will cooperate with authorities. As it is a free VPN service and hence doesn’t really have the financial muscle to fight with copyright holder groups. Sorry, but that is what you get when you sign up for a free VPN service. Betternet allows users to engage in torrenting as well. This is certainly a rarity with free VPN service providers. And perhaps it should make Betternet one of the best free VPN service providers in the world. MOreover, by allowing Torrenting on its VPN servers, Betternet certainly has a feature that very few of its competitors have. However, all these features, raise a very legitimate question. What Is The Revenue Source For Betternet? To run a VPN service business, you need a lot of technical knowledge and finance. It is not a cheap business to step into. In other words, the VPN industry is an expensive one. Not to mention that you have to invest a lot of time into it if you want to make sure you survive. So how does Betternet offer everything for free? The simple answer is, Betternet isn’t exactly free. Betternet has a premium plan and that is one source of revenue for the company. But Betternet doesn’t mention it as prominently as it should as far as its official website is concerned. We think that is odd. Apart from that, Betternet has done a good job of explaining how the company makes money from its VPN service. The company says that if offers free sponsored applications. Its mobile app has an Install an app icon or a button. And users can click this button to the latest offering for an app installation process. When a user installs an app, the VPN service earns money. They pay Betternet some money when a free user downloads an app. The company says it also earns money by showing free users videos. Users can click on the button that says Watch A VIdeo And Connect. 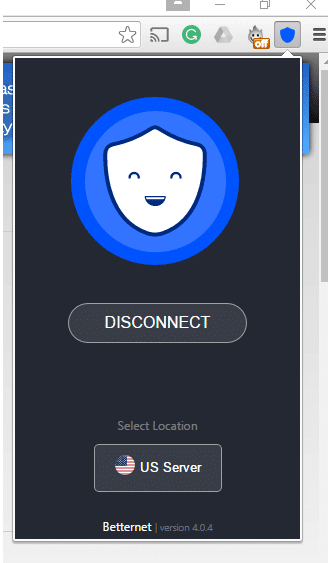 That button is present in the Betternet VPN app. So you don’t really have to find it. Users can watch a simple and short video. And every time a user watches a video via Betternet app, the company makes money. Our research for this Betternet review shows that the mobile app indeed offers users the opportunity to view advertisement videos. And offerings to install a free app. But that doesn’t happen in the desktop version of the VPN service. Betternet does offer a dismiss button to get rid of the offers though. So it is strange how such a business model is helping the company stay alive in such a cut-throat industry. Betternet has a business model that looks and sounds great for the end user and the overall user experience. 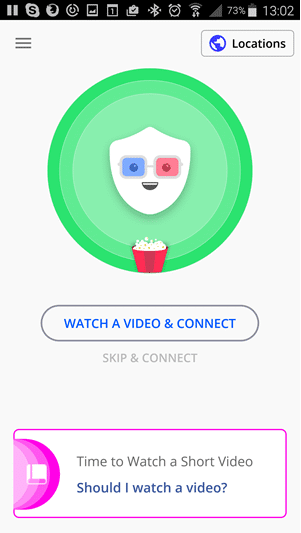 Who in their right mind would want to install an app or watch an advertisement video if there is an option to cancel the offer and just connect to a VPN server. And that takes us back. Back to the same question. The question, that asks, how does Betternet generate revenue? Betternet has some more explanation. The company says that the business model described before has worked for the company so far. And it has worked very well. And that they would like to thank their supporters. Of course, if users are watching ads and downloading apps, then indeed they are great users. The company says that it receives tons of emails its users who frequently share their good experiences with them. These users, according to Betternet, also tell the company that they have installed their recommended mobile apps and those apps are actually very useful. Let’s not make any judgment calls just yet. Betternet is based in Canada. Or more specifically it is registered in the country of Canada. Canada, as a country, is considered as Ok if a user wants to engage in torrenting. But Canadian authorities did pass Bill 11 back in 2015. And that bill will make sure that it ends any unfounded freedoms for VPN service providers. You have to understand the fact that this bill would mandate all internet service providers to keep internet records. Will this bill also apply to all the VPN service providers in the country? We’re pretty sure that it will. There is also Bill C-51. In other words, Anti-terrorism act 2015. It hasn’t actually become law but if it does, all VPN service providers will face a lot of trouble. Mostly because it has sweeping legislative statements. This bill will allow government agencies along with the policy and CSIS vast amount of powers to access and share information about groups and individuals between themselves. This is unprecedented sharing of information. If you don’t know what CSIS is, then think of it as Canada’s NSA. The bill will also practically lower the official threshold required that law enforcement agencies need as proof of arrest if they suspect someone of terrorist activities. The bill will also give Canadian spies the official authorities to disrupt and counter-message radical websites. And nothing would stop them from doing the same to websites that are outside of Canada. Canada is also a member of the spying alliance program known as Five Eyes. These spying agencies share their intelligence with each other across the border. Hence, they can count on each other for vital intelligence on their people. They can also obtain data from other members of the paying alliance through legal channels. Most of you would already know that under current laws it is illegal to share information about one’s own citizens. Betternet, as a VPN service provider, doesn’t keep any usage logs. In other words, it doesn’t really know what its users are doing while they are connected to the internet via its VPN servers. But, the company does keep those devilish connection logs. Connection logs contain metadata about users. Moreover, third party advertising companies can compromise the privacy of free users if they want to do so. The company says that third party companies are allowed to use technologies in order to access some of the company’s data. That includes (but of course is not limited to) cookies. Third party companies can use these to estimate the efficiency of all their advertising campaigns. Moreover, Betternet does not control the activities of its third-party company partners. As far as information regarding technical security is concerned, there isn’t much to talk about. Because Betternet doesn’t give you anything. It says on its official website that the company tries its hardest to ensure user privacy. And it does that by offering OpenVPN along with AES256 bit encryption. The company combines that with 128-bit AES-CBC in the case of IPSec. Betternet says that it distributes all of this traffic between hundreds of VPN servers with shared IPs. This, according to them, ensures that each user can blend with the rest of the crowd. This also ensures that each user’s identity is maintained. Our research for this Betternet review shows that most VPN service providers use IPSec for their iOS apps. If you try to contact Betternet customer service to learn more about this situation, you are likely to get no response. Hence, we can’t really say what type of RSA handshake key encryption size the company uses. Moreover, we also don’t have any information on the authentication method that Betternet uses. And of course, Betternet doesn’t tell you if it uses Perfect Forward Secrecy for its OpenVPN VPN connections. The official website looks amateurish. It doesn’t have a great design. But it is rather functional. The primary purpose of any official website is to advertise its product effectively. Betternet official website does that. But it does make rather bold claims about the services that are on offer. We don’t think Betternet is nearly as popular as the company says it is. The official website also gives new users and potential users information on how the company makes money. And hence operates a free VPN service. However, it doesn’t give you any hard facts. Customer support is important for any VPN service in the world of today. And the only way to make yourself stand out from the crowd is to offer something that no one else is offering. Most of the times, VPN service providers separate from each other based on how they handle the auxiliary services. Those services include customer support. In Betternet’s case, we’re not sure if it even exists. The FAQ section on the website is short on information. And the information that is presented in the section is useless. The Knowledge Base, or so Betternet calls it, is searchable. Again, this section too doesn’t have any useful information. Ranking customer support is always difficult. Because each user may get a completely different experience depending on the time and the method. The only way you can contact Betternet customer support is via its ticket based system. You can send your query directly to the Knowledge center. And then wait for days. Expect them to not respond. At best, expect Betternet to respond after a few days have passed. And that is if you ask a single question. That doesn’t say good things about the VPN service’s transparency and in turn, trustworthiness. You can download all of Betternet free apps (mobile ones) from places such as the Google Play Store and Apple App Store. You can download the Windows version of its apps from the official website. Premium users can also make use of in-app purchases. That only holds true for Android and iOS version though. Doing so will connect your Google ID or your Apple ID with your VPN subscription. So exercise a bit of caution. If you request a premium subscription, the company will require an email address. With this email address, you can use the premium Betternet account and all of your devices. You will receive a confirmation email and you will have to authorize the app on each of your device. The Windows version of Betternet VPN client is plain. But it does have the auto-connect option. Moreover, it seems like it does protect the user against DNS leaks. That comes as a built-in feature for VPN connections that use OpenVPN. The Betternet VPN client does give users respite from advertisement though. What we mean by that is it shows you very little amount of advertising. The only advertising you’ll see that is somewhat interrupting in nature is the one that you’ll see what when you connect to a VPN server. Betternet will show you an advertisement in the form of a browser window. And this browser window will take you to the official Betterspot web page. Betterspot is just like Anonabox. And Betternet Technologies Inc sells it as a part of the company’s product line up. Premium users don’t get to have a premium desktop client. Hence, even if you are a premium user you will have no other choice but to connect to a VPN server that Betternet chooses for you. As mentioned before, most of these servers are located in the US. Does Betternet Work With US Netflix? Our research for this Betternet review tells us that if you visit the US Netflix, you will get an error. Netflix will tell you that you are using a proxy and hence it has blocked your connection. We have already mentioned the fact that Betternet tries to target mobile users. These are users who use iOS and Android devices. And hence it only offers its premium service on Android and iOS devices. The Android app is reasonably well built and is easier to use than some of the other VPN service providers’ Android apps. The Windows client lacks any advanced features. In fact, it doesn’t even have some of the basic features that you would expect of any VPN service provider. Again, Betternet is free for the most part. So we are not complaining. On another note, if you want to cancel your Betternet subscription then you will have to do so via Google Play Store or Apple App Store interface. There is no user interface to achieve the same with Betternet mobile apps. Moreover, if you want to know how to cancel your Betterenet subscription on Android smartphone, then click here. The process of canceling your Betternet subscription is rather easy when on Android. We expect the same for the iOS version as well as it doesn’t really involve Betternet. A VPN service provider could have all the features and the security technologies in the world. But if it isn’t fast, it isn’t of any use. And since Betternet has shown poor results in other categories it better get the speed part right. To test a VPN service provider’s speed you have to make use of speed testing websites. First, you have to test your internet connection without VPN service. And then you to test it with a VPN service. After that you have to perform the speed test multiple times, at least thrice, to average out the results. And while doing so, you have to make sure that you vary the VPN servers. The farther the VPN server is from your true location, the more drop in speed you will experience. With that said, all VPN service providers decrease your internet speed. But the good VPN service providers do so on a very limited scale. A poor VPN service provider will eat up all your internet connection speed. And you’ll have no choice but to see that annoying buffer sign while streaming content. The Betternett free VPN service is atrocious. In other words, it will decrease your internet speed. Prepare for a massive performance hit as well. As for the premium service, Betternet performs much better when compared to its free service. But that doesn’t mean it can compete with other good VPN service providers. Even the premium service lags behind the industry average. Expect up to 50% drop in speed. A premium VPN service provider would not give you this much decrease in speed. Some of the best VPN service providers can maintain eighty to ninety percent of your original VPN speed. And these are the ones you should sign up for. Of course, you will have to connect to a VPN server that is located nearest to your physical location. Interestingly enough, Betternet performed better as far as upload speeds went on its free version when compared to its premium version. We can’t explain how Betternet manages to give better performance on the upload speed for its free version. To put it another way, Betternet does protect users against IPv4 DNS leaks. But Betternet makes no effort to protect users against those irritating WebRTC leaks. If you want to use Betternet as your primary VPN service provider then make sure you fix this issue on your own. We can’t comment on whether it protects you against IPv6 leaks because most of the online users don’t use this technology. At least we don’t test for it. IPv6 leaks only affect desktop software applications. We think that this issue should not even exist on mobile devices. We have already mentioned the fact that Betternet also sells devices which are similar to Anonabox devices. These are basically portable VPN devices. Or you can also think of them as Tor-enabled routers. Betternet also has a browser extension for Chrome. It is basically a free VPN extension. It is also available for other browsers such as Firefox. And you can always use a CHrome extension for Opera if you search enough on Google. The browser extension works pretty well. But again, you will have to come to terms with the fact that Betternet will automatically connect you to a US server if you are a free user. What about the speed performance of the browser extension? Our research for this Betternet review shows that there is hardly a difference between the performance statistics of the browser extension and the mobile apps. You can use these browser extensions to make use of Betternet on platforms such as Linux and Mac OS X. Conclusion. Should You Use Betternet? It allows P2P file transfers. And that holds true for the free users as well. The business model is shady. Something doesn’t add up and Betternet doesn’t want to tell you about it. Customer support is poor, to say the least. The company is based in Canada. Canada is no more a safe country for user data and VPN service providers. If you are concerned about privacy, leave VPN service providers from Canada. We hope that this Betternet review was comprehensive enough. But you didn’t read the whole review did you? Otherwise, why would you want to read the bottom line? Hence we have to rank it based on the fact that it is a free VPN service provider. In other words, we won’t compare it with the likes of IPVanish and NordVPN which are premium paid VPN service providers. Betternet is as cheap as a VPN service can get. Betternet has priced its premium service just at the right spot. And since it is cheap (and free) we can find enough stamina within ourselves to overlook some of its critical flaws. 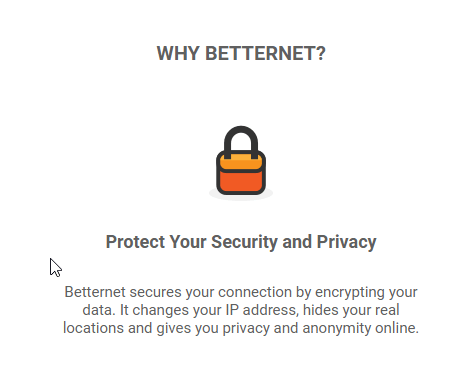 However, if you are looking for a VPN service provider that will protect your privacy and guard your anonymity, then Betternet is not for you. Of course, it is another fact that you will have to pay a lot more than what you would pay with Betternet if you want top notch security and privacy. For users who only want to change their location or bypass basic firewalls and unblock basic websites or even protect themselves when they connect to public WiFi Hotspots, Betternet manages to work reasonably well. In other words, even though it is free, it is slow. So no point in torrenting using Betternet. But think from the other side as well. You can engage in P2P file transfers. Even if you are a free user you can P2P and take part in torrenting. In short, Betternet is a free VPN service that barely manages to be decent. Know what you are getting into before you sign up for Betternet. Because, in the online world, you get what you pay for. Please read the update portion of the review that appears at the top. And if you don’t want to read that, then know that Betternet is as close to a scam as a VPN service can get. If you are serious about your privacy and security then take a look at IPVanish. It is our top-ranked VPN service provider. based in Canada. Which is terrible. Betternet VPN service is free. But it did manage to surprise us on many occasions. And we don't mean that positively. From the outset it is a straightforward free VPN service. But we assure you that it is not. You will have to read the full review to find out what is wrong with this VPN service provider. Update: This VPN service is a total NO-NO. New research papers have revealed that it infests its users with malware. So naturally, you should stay away from Betternet. Is Piracy Ethical? Are Pirates Dangerous? this is a really old review as betternet does have windows platform for premium users and it has locations outside the USA. its big problem is slow customer support. lack of faq relating to windows. one has to email them using the contact us on their app and use something else. one cannot see the fastest server for your location either so it is a bit random which server you choose unless you need a specific one. BBC iplayer does not work when using the UK server. For 3 months it is cheaper than other VPNs. None of whom really operate throughout China. Express VPN constantly failed me in rural areas of China Most vpns may be ok in ng cities and some secondary ones. but to claim they work all over is just not my experience. i have tried express, idcloasker, Nord, vyper, OpenVPN all of which were not reliable. It would seem that one needs good speed throughout the day for these to work. We’ll take into consideration your suggestions and will update our review as necessary.